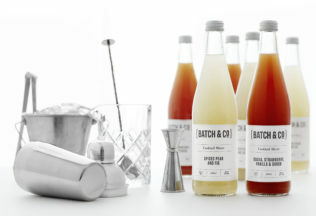 Sold under his new business venture, Batch & Co, the cocktail mixers are designed to help consumers make bar quality cocktails at home. Thomas Kiltorp is a former Age Good Food Guide Bartender of the Year and is the creator of numerous cocktail collections for notable Melbourne bars. Kiltorp said he was inspired to make the mixers after repeatedly hearing bar customers say they wished they could make quality cocktails at home without the hassle. “A great cocktail has a balance of sweet and sour, mouthfeel and viscosity,” Kiltorp said. The range’s two flavour varieties are Guava, Strawberry, Vanilla & Shrub and Spiced Pear & Fig. Both mixers can be used to create cocktails or mocktails and are available from Dan Murphy’s online. The recommended retail price is AUD $14.95 per 500ml bottle. Charlie’s Cookies is promoting what it describes as an ‘artisan’ range of biscuits for cafes.